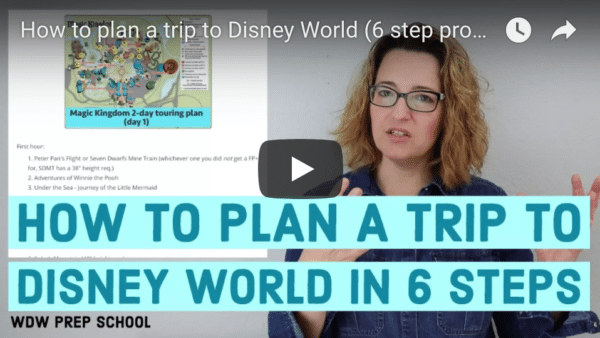 In recent years, Disney World has expanded the number of premium events available for guests to add to their visit, and while we try to emphasize to readers that you don't have to spend anything extra to have a fantastic (and memorable!) vacation, every now and then one comes along that we think might be worth it for some guests. The Star Wars: A Galactic Spectacular Dessert Party is one of those events. Check out the information below to learn more about this event and see if it sounds like a good fit for your family. What is it and where is it located? What can I expect to be served? How do you book it? How much does it cost and what does that include? How is the view for fireworks? 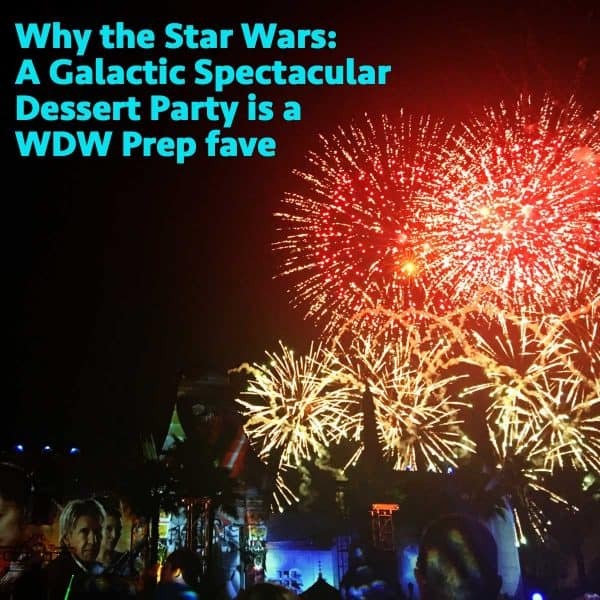 Is the Star Wars: A Galactic Spectacular Dessert Party worth it? The may have arguably the best desserts and drinks of all the dessert parties. It also provides a special viewing area for the show that isn’t as good as it used to be, but does keep you from having to find a spot way head of time. 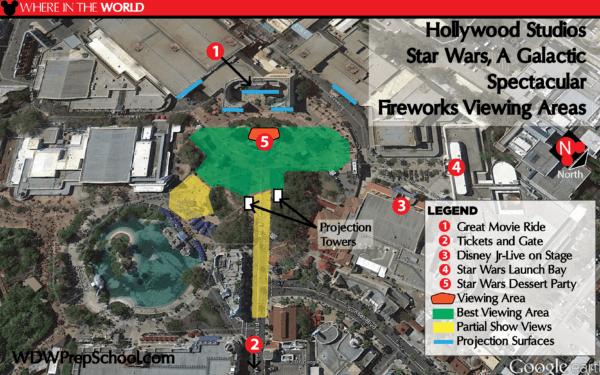 The Star Wars: A Galactic Spectacular Dessert party is a premium event offered at Hollywood Studios on the same nights that the fireworks are held. 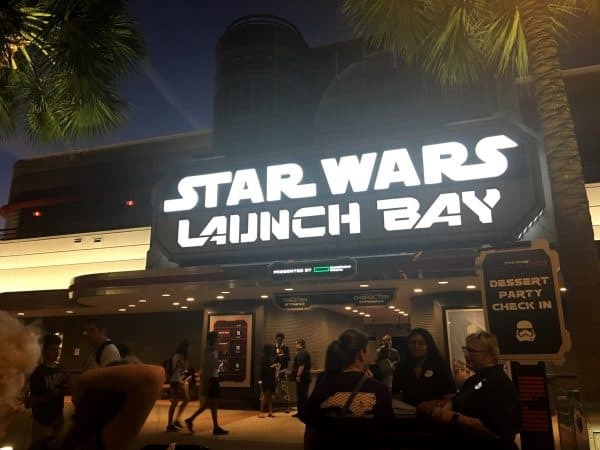 Guests are first treated to a Star Wars-themed dessert party inside of Star Wars Launch Bay before being escorted outside to view the show from a roped-off area at one of the best viewing locations in the park. Playing off of the Star Wars theme, guests are treated to a fairly broad and tasty selection of galactic-titled food, including a couple different cupcakes (there's a BB-8 lemon-flavored option, and a Darth Vader chocolate-peanut butter flavored one), an amazing freeze-fried Nutella truffle, several flavors of cookies, a delicious warm bread pudding complete with a selection of toppings, and a sampling of fruits and cheeses. There are both alcoholic and non-alcoholic drink options available. In addition to water and soft drinks, guests that prefer non-alcoholic options also have 2 punch-type beverages from which to choose: Lunar Lemonade (a watermelon-flavored lemonade) and Jettison Juice (passion orange guava juice with mango syrup). 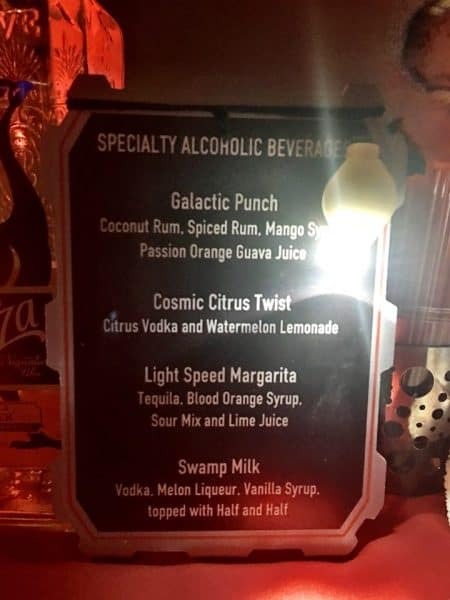 There are also 3 specialty alcoholic beverage options: Galactic Punch, Cosmic Citrus Twist, and Light Speed Margarita. All 3 of the drinks are served at a bar and are included in the price of your ticket. Bartenders do accept tips. This party has assigned tables with chairs for guests. This is a huge perk. One of the downsides of this party previously was that there were no seats but this has since changed. You can book the party online, and while Disney says you can book up to 180 days in advance, it frequently isn't available until later. If you don't see it open, keep checking! The cost for this party is $79 for adults and $45 for children ages 3-9. 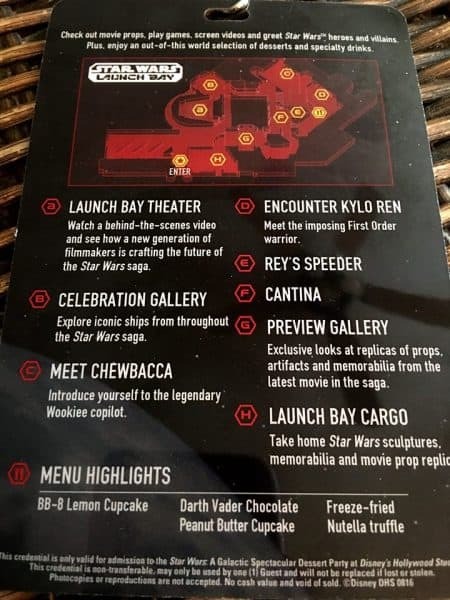 Included in that cost are all of your desserts and drinks, a reserved viewing area for the fireworks, a commemorative lanyard, and a novelty Star Wars souvenir item. Guests with tickets to the dessert party check-in in front of Star Wars Launch Bay. Your ticket and confirmation information will give you a check-in time; however, it is recommended you check-in 30-45 minutes before your time as guests will be allowed in early. Once checked in, guests receive their lanyard and are allowed into a special roped-off area of Launch Bay. Star Wars Launch Bay remains open during the party; however, only party guests can move back and forth between the roped-off area, exhibits, and character meets of the Launch Bay. About 15 or so minutes before the fireworks start, Cast Members will begin escorting Dessert Party guests out to the reserved viewing area. As you enter the viewing area you will be handed your souvenir mug. It is for some people. Part of the value of this event comes from the alcoholic cocktails, so if you have a large portion of your party that won't be consuming any alcohol you may not get as much bang for your buck. But if you are a Star Wars fan (or even just a fireworks fan!) 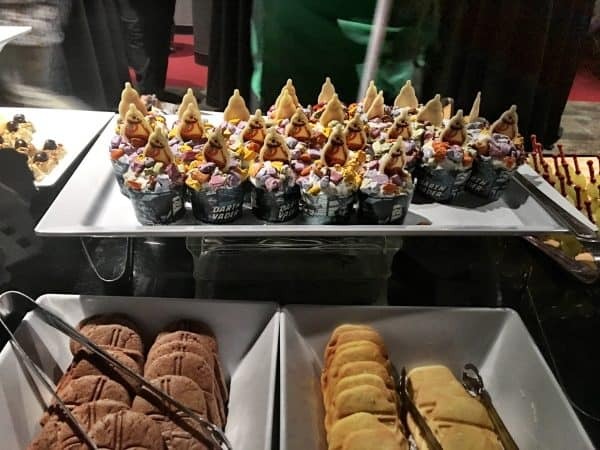 and you are looking for some good food, a couple cocktails and a good view for a nighttime show, then this is the best option of the 3 Disney World dessert parties and will likely be worth it for you. Check the comparison chart below for more info (click the chart to view it larger). Have you tried the Star Wars: A Galactic Spectacular Dessert Party? Tell us how you liked it in the comments below. I read on the Disney website that seating was ‘banquet style’, where you would be seated with other guests. is this new? Are the Jawas still roaming around the dessert party? Are there any nearby places you recommend to have dinner before the desert party starts? Excellent! So much useful information in the article above. Thanks so much for posting this. Would there be enough time to make the 7pm Fantasmic showing and then to this at 830? Yeah, if the schedule is 7 and 8:30, you’ll be able to do that without a problem. Thanks for the great review! Would you please tell me if it is it possible to get just a shot of alcohol with water/and or diet soda? I don’t know for sure, but I bet they would do that without a problem. When you walk up to the bar, they just ask what you want and you can let them know that you’d like a shot rather than the whole drink. Water and diet soda are available at a table nearby. I assume the fireworks dessert parties are only available on the nights the fireworks shows are scheduled, right? I know that sounds like a stupid questions but I have a horrible nightmare of shelling out hundreds and then being given a cookie and told there isn’t any show!